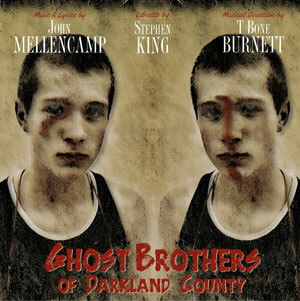 An all-star lineup of musicians and actors has teamed up for Ghost Brothers of Darkland County, a “Southern gothic supernatural musical” created by Stephen King, John Mellencamp and T Bone Burnett. The collection is due out via Hear Music/Concord on March 19, 2013. According to Rolling Stone, the group has met with investors but has no definite plans to hit Broadway. Ghost Brothers came about after Mellencamp told King about a cabin on his Indiana property where two brothers had gotten in a fight over a girl. One accidentally killed the other, only to die along with the girl in a car crash shortly after. King had the idea for a play, and the music developed from there. The Ghost Brothers story follows two sets of brothers—the ghosts of Jack and Andy, who died in a murder suicide; and their living nephews Frank and Drake, who seem headed for tragedy. Flitting between the spirit and physical worlds is “The Shape,” a devilish figure voiced by Elvis Costello. The album’s first official release is Costello’s “That’s Me,” which can be heard here. In addition to Costello, Ghost Brothers features the talents of Rosanne Cash, Sheryl Crow, Neko Case, Taj Mahal, Ryan Bingham and Kris Kristofferson, along with actors Matthew McConaughey, Samantha Mathis and Meg Ryan. Standard and Deluxe editions of the release will be offered, and the Deluxe version will include a “Making of Ghost Brothers” mini-documentary DVD.